Raccoons cause their fair share of problems for Ft. Worth home and business owners. Knowing how to identify common raccoon problems and deal with an infestation can save you plenty of time, money, and headaches. The Critter Control of Ft. Worth staff is familiar with raccoons’ food sources and behavior. We are here to help you identify and eradicate common raccoon problems in and around your home. You probably won’t find a raccoon in your home at first. Instead, you may see evidence in your yard of one of the most common raccoon problems – foraging. Raccoons often dig in yards and gardens for vegetation and other food. If those food sources are scarce or unsatisfying, they may venture onto your porch and gnaw on any plants kept there. Raccoons like pet food, so keep it secure if you have a pet you feed outside. When possible, feed your pets indoors. Raccoons are also notorious for getting into homeowners’ garbage cans. Like similar household pests, they enjoy human leftovers and spoiled food. Spending so much time in place like dumpsters can also exacerbate diseases and parasites raccoons carry. To deal with these common raccoon problems, keep your garbage cans sealed. Do not throw spoiled fruit or meat into a dumpster on its own. Burn meat wrappers when possible and double-bag fruit. Sometimes raccoons, especially females, seek shelter in your home for themselves and their babies. You may notice evidence of this in fall, winter, and early spring while temperatures are still cold. Check your chimneys and screens; raccoons like to use openings in these to get inside your house. If your chimney hasn’t been capped, Critter Control can do it for you. If you are experiencing these or other common raccoon problems, call or contact Critter Control today. 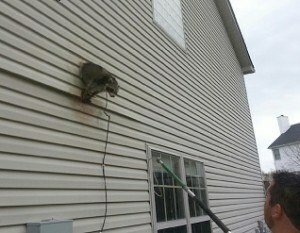 We will humanely remove the raccoons and help you with an exclusion plan.